In October 2018, the University of Cape Town (UCT) joined institutions around the world in celebrating International Open Access Week. 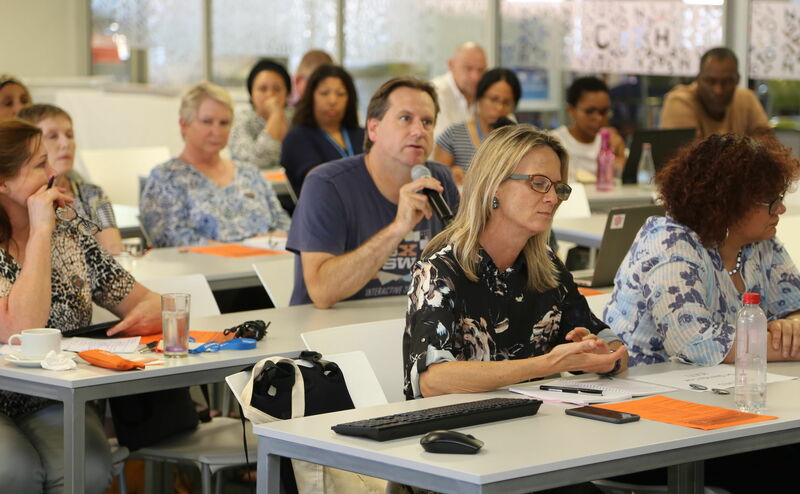 UCT Libraries, in collaboration with Disability Service, the Centre for Innovation in Learning and Teaching (CILT) and Postgraduate Studies, hosted a seminar on “Designing equitable open access foundations for social justice”. The event highlighted UCT’s explicit social justice agenda in encouraging more open, inclusive approaches to scholarship. A series of videos from the 24 October seminar document the three thematic threads of the event: open access and social justice; open access and publishing; and voices from the UCT community. This opening session provided the framing for the seminar in terms of the focus on inclusivity, social justice and access. Professor Caroline Ncube from the UCT Law Faculty provided the seminar opening address. She summarised social justice as a quest for equity and fairness in all aspects of life, including economic justice, public participation and social cohesion. Referencing the White Paper on Post-School Education and Training of 2013 and the National Development Plan 2030, she argued that success in national goals related to education, innovation and training hinges on access and success in higher education. In the context of social justice, Ncube pointed out that content does not automatically support equity or advance social justice merely because it is open. She argued that open educational resources and other open access content needs to be carefully crafted if these materials are to address economic, political and cultural inequalities. Ncube highlighted the importance of considering those who have intermittent access to online content or are hindered by inadequate infrastructure, citing the ability to produce print materials as an important consideration. Strategies for addressing disability access, such as audio translation and subtitling, were also cited as a crucial factor in ensuring equitable access to content. The presentation by Jill Claassen from UCT Libraries focussed on the institutional open access and social justice agenda. Highlighting access to information as a basic human right, she pointed out that Africa, a continent with many social and political challenges, is particularly in need of new, open forms of knowledge sharing and production in order to address its current challenges. Claassen pointed out that shrinking university budgets and exorbitant increases in journal subscriptions have forced libraries to cut subscriptions; the domino effect of which has been that many African researchers are cut off and excluded from current debate in critical areas of engagement. She made the point that free and unrestricted access uplifts and empowers those who have been marginalised in our society. It also facilitates and democratises the creation of knowledge. In the context of UCT, Claassen argued that legal, open content production and sharing demonstrates the institution’s moral obligation to supporting economic growth and development on the continent. As a leader in African research production, it is imperative that UCT implements its social responsiveness strategy to share its teaching and research output for the good of the public, contributing to the improvement of the continent’s knowledge economy. Watch the video of the speakers in the "Open access and social justice" seminar component. The session on open access and publishing focussed on two open textbook publishing initiatives at UCT – "Constitutional Law for South African Students", a textbook being developed in the Law Faculty, and the Digital Open Textbooks for Development (DOT4D) initiative in CILT. In her virtual presentation, Professor Penny Andrews from the UCT Law Faculty spoke about the change in legal education entailing a change in mindset. Quoting Chief Justice Pius Lange, she invoked the principle that transformation is a permanent ideal, and thus an ongoing enterprise. She also highlighted the fact that she did not think of constitutional law as just another discipline, and that she considered it key to transforming all areas of law. Constitutional law, she argued, needs to be approached with a vision of transformation. The initiative to produce an open textbook, focussing on a uniquely South African perspective of the South African constitution and the laws which protect or interrogate it, was therefore viewed as an important tool in addressing transformation. Andrews reiterated the modern, often-used maxim that educators have moved from the sage on the stage to the guide on the side. The UCT constitutional law open textbook therefore centres on the student as well as academic staff and alumni, addressing a range of questions and thinking about what happens outside of the classroom. Her presentation highlighted various aspects of the open textbook’s approach towards transformative constitutionalism, interactive content and visual materials, teaching methodologies, and assessment. There was also an explicit focus on linking the resources utilised in the classroom to library resources, which is aimed at continuous training in electronic research and the ability to access free legal resources. Dr Glenda Cox from CILT delivered a presentation on the DOT4D project. The DOT4D initiative, a new project funded by the Canadian International Development Research Centre, is aimed at conducting research to better understand the open textbook publishing landscape at UCT. It is also making small grants available to support academics in open textbook production and conducting advocacy activity to support the national open education policy-making agenda. The context for the DOT4D project is curriculum transformation in higher education, questioning what knowledge is being produced and whose knowledge is being foregrounded in the UCT teaching context. Within this context, the DOT4D project is examining issues of representation, inclusivity, gaps, silences and absences, interrogating the question of who is not being represented in the current curriculum. It also addresses the question of how open textbooks can be utilised as a means to promote greater social justice and inclusivity in the current teaching and learning process, both at UCT and in other South African institutions. Watch the video of the speakers in the "Open access and publishing" seminar component. The session on voices from UCT communities was aimed at providing a platform to profile the experiences of UCT academics and students who are marginalised or grappling with access issues on an everyday basis. The first speaker in this session, Zuleikha Abrahams, is a blind mature student who shared her experience of pursuing further study while negotiating the challenges of operating in an institutional context which does not adequately cater for people with disability. Abrahams outlined her experience of utilising tools such as the Job Access with Speech (JAWS) screen reader as well as navigating the frustrations of working with text which was only available in hard copy under full copyright. Highlighting the challenges of breakdowns in communication and the persistent issue of time constraint, she provided insight into what is required for blind students to work with and navigate their way through learning materials. Exams and assessment activities were described as particularly stressful and challenging. The issue of expiring licenses on proprietary tools for disability access were also highlighted as a hindering factor. The second speaker in the session, Ike Nwanze, is an academic from Disability Studies who spoke about the multiple layers of context and interpretation that some students have to navigate before they get to the actual process of learning. In making it clear that issues around transformation of curriculum are intrinsically linked to issues of access, he addressed the critical issue of interrogating which enabling or disabling factors students bring with them into the learning context and the question of how they are going to learn. Nwanze differentiated between access and equity, making it explicit that access does not equal equity. In the context of the universal design for learning model, he questioned how one goes about adapting curriculum to accommodate various ways of representation, various ways of engaged learning, and various ways of enabling learners to express themselves. While noting that good progress is being made in assistive technology for students with impairments, he stressed the fact that content creators need to bear in mind that these tools and technologies need to be able to connect to multiple layers of content, which requires strategic engagement in the process of resource design. He also pointed out that when lecturers took steps to accommodate students with disabilities, they often ended up accommodating a wide range of other learning challenges, such as those experienced by students who are accessing content in their second or third language. The third speaker in the “Voices” video segment, filmed after the seminar event, is Wandile Dlamini, a UCT student activist in the “Fallist” movement which arose out of the 2015/2016 #Rhodesmustfall and #Feesmustfall protests. As Dlamini states, the Fallist movement seeks to decolonise the lived experience of black students in South African universities. She points out that the #Feesmustfall movement addressed the unaffordability of higher education studies for the majority of South Africa’s youth, but that there is an ignored aspect to financial accessibility – namely, the high cost of textbooks. Stating that textbooks are integral to passing many courses and an institutional requirement, she raises the issue of copyright as being at the heart of the crisis around textbook cost and accessibility. Citing textbook costs of over five thousand rand per year, depending on year of study and discipline, she highlights the fact that lecturers are not adequately aware of the challenges students experience in terms of securing access to textbooks. Lecturers also often insist that second-hand textbooks are inadequate, meaning that students are not able to take advantage of the large second-hand textbook market. In a context where most students find themselves in dire need to access textbooks which they can’t afford, Dlamini argues that the last recourse available to them is to illegally download textbooks and other learning materials (assuming that they have the electronic access to the devices and bandwidth required to do so). Watch the video of the speakers in the "Voices from UCT communities" seminar component. The conversation around equitable access, curriculum transformation and social justice continues as UCT and other South African institutions grapple with the complexities of the current context in order to find meaningful, creative, inclusive open access strategies. Access the slides from the UCT Open Access Week seminar. Visit the OpenUCT repository of open access scholarly content. Read the UCT Open Access Policy.